McKeesport, PA - His Grace Bishop Dr. MITROPHAN scheduled the Twenty-Third Annual Pittsburgh Deanery Meeting to be held at St. Sava Serbian Orthodox Church in Mckeesport, Pennsylvania on June 12, 2010. The host priest was Very Reverend Stevo Rocknage. The Dean of the Pittsburgh Deanery is Very Reverend Stavrofor Stevan Stepanov. The designated speaker for the meeting was Protonamesnik Milovan Katanic. 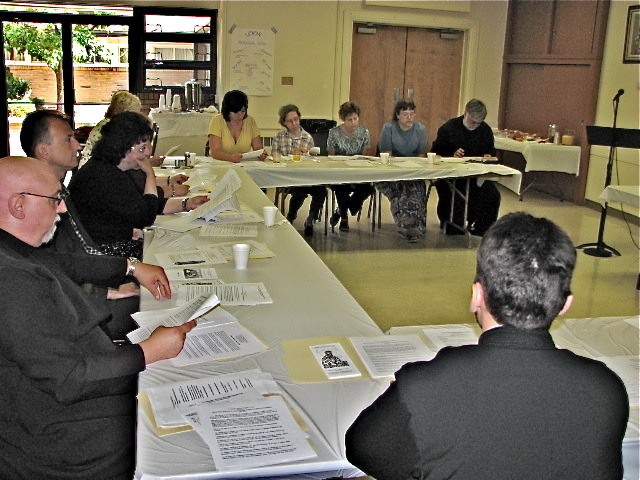 The Pittsburgh Deanery consists of Pennsylvania parishes in Aliquippa, Carmichaels, Johnstown, Mckeesport, Midland, Monroeville, Pittsburgh, and Youngwood. The Holy Resurrection Church in Steubenville, Ohio and Holy Trinity Mission Parish in Fairmont, West Virginia are also part of the Pittsburgh Deanery. Participants in the meeting in addition to the aforementioned include:Episcopal Deputy-Very Reverend Stavrofor Dragoljub Malich, Very Reverend Stavrofor Rade Merick, Very Reverend Lt. Col. Adam Yonitch Jr, Very Reverend Rajko Kosic, Reverend Father Miladin Blagojevich, Reverend Father Milos Markovic, Nikola Klipa, Janet Tumbas, Rosemarie Marinkovich, Mitzie Hunchuck, Nicole Belich, Violet Petrovich, Janice Pcnolinski, Joyce Yovetich. Protinica Joann Rocknage and KSS Federation Vice-President DeeDee Baskot worked hard for the benefit of the meeting. The meeting participants were grateful for the hospitality provided by the host parish. During the ensuing discussion of Father Katanic’s presentation and the review of parish reports presented, the meeting participants expressed a clear interest in having a Diocesan teachers’ conference with anticipation that more teachers would be in attendance and involved. Christian education has an important place in each parish of the Diocese. Continuing efforts are necessary to address the learning needs of church school teachers, parishioners and individuals attracted to the Christian life in the Holy Orthodox Church. His Grace Bishop Dr. MITROPHAN encouraged working with youth and cited the fine example of a youth choir singing at the recent church consecration in North Carolina. His Grace also spoke about the importance of reading the Holy Scriptures.